Trojan Mice - back a winner! I haven’t found the phrase on Wikipedia (yet), but a search on Trojan Mice will take you to an organisation of the same name. 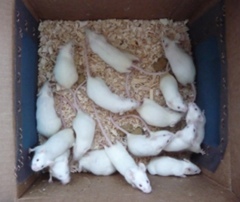 They describe: “Trojan Mice….. are small, well focused changes, …..introduced in an inconspicuous way. They are small enough to be understood and owned by all concerned…” They also talk about complexity theory and complex adaptive systems. It was in this context where I first heard the concept explained by Dave Snowden who spoke about “safe to fail” pilots or experiments by as part of the Cynefin Framework. For complex situations Dave talks about: “the relationship between cause and effect can only be perceived in retrospect, but not in advance, the approach is to Probe – Sense – Respond”. There is an excellent video from Dave which explains it beautifully. For me, the Trojan Mice are effectively the ‘probes’. as if there it is a ‘simple’ cause and effect relationship in place. Large scale, ‘single right answer’ solutions are introduced which ultimately don’t end up solving the problem (aka FAIL). I’m sure I am not alone in having seen this approach. If you are lucky, everyone learns and moves on, if not, well……. you end up with lots of ‘flogging the dead Trojan Horse’, or worse still looking for a culprit. You are better off setting loose the Trojan Mice, and backing the winners. The big advantage of carrying out “safe to fail pilots” is that they can be scaled up if successful or abandoned if not. The important thing is to carry out a number of pilots and learn from failure (and success). Complex: a huge number of variables like accessibility, organisational policy, confidence to participate, IT competence etc. Adaptive: the very act of people using the media will change the nature of that media (they are adding content) and the way in which others subsequently use it will also be changed. Just think about how the comments people put on a post will influence the following comments. supporting a network of foster carers. Established using limited resources and a free IT platform. Self moderating and sustaining through the group. Details here. Public Sector Social Media Yammer Group. Another very successful online OCoP established for zero cost. Over 100 people contributing. Details here. Bernie the Sheep Pilot. Social marketing campaign using social media to tackle the deliberate setting of grass fires in South Wales. Resulted in a 40% reduction in predicted fires and saved £120K. Now being scaled up. Details here. materials posted on public service websites in Wales. Developed at low-cost, currently in beta, please leave them a comment. The introduction of social media into organisations is complex territory. Prediction of what will happen as the result of an action is very difficult. Better to use a Probe-Sense-Respond approach and set up multiple ‘safe to fail experiments’. These ‘Trojan Mice’ will eventually deliver rewards; you may just not get what you were expecting. That’s fine,embrace a bit of uncertainty. Picture source: http://bit.ly/r02xuQ genuine mouse racing….